Born between August 23 and September 22 is the sixth sign of the zodiac, Virgo; a feminine, negative, mutable, Earth sign. Their planetary symbol is the Virgin. The symbol of the virgin may be used for Virgos in part because it shows their cool and disciplined ways. Typical Virgo traits are rational, practical, intelligent people who are able to think clearly thanks to the ruler, the winged Messenger of the Gods, Mercury. Do you want to read more Virgo traits or personality? Use the navigation links below to go to the section you want to read more about. Astrologically known as the “sign of service”. Of all the zodiac signs Virgos are the most selfless. Their deep sense of the humane leads them to caregiving like no other, while their methodical approach to life ensures that nothing is missed. The Virgo is often gentle and delicate, preferring to step back and analyze before moving ahead. Are you a proud Virgo? Share your zodiac sign’s main characteristics with your friends. 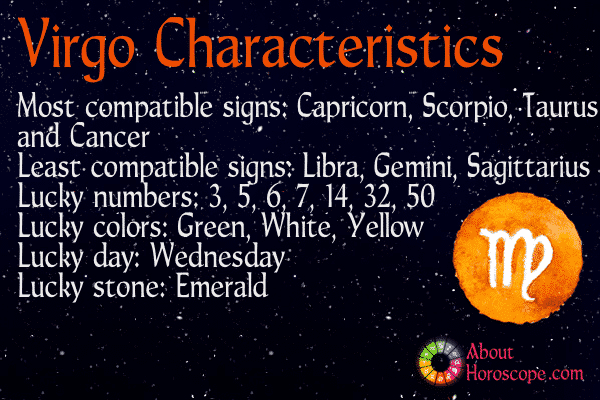 Below you can find an infographic to share with your friends and show them how awesome Virgo is. They are usually observant, shrewd, critically inclined, judicious, patient and conservative in all facets of life. On the surface they are emotionally cold due their habit of suppressing their natural kindness. They are intellectually enquiring, methodical and logical, studious and willing learners. They have an excellent eye for detail but they may be so meticulous that they neglect larger issues. But the outward lack of feeling may, in some individuals born under this sign; conceal too much emotion to which they are afraid of giving way because they do not trust others nor do they have confidence in themselves and their judgments. This is because they are conscious of certain shortcomings in themselves of worldliness, of practicality, of sophistication and of outgoingness. Virgos are often perfectionists. They are never satisfied with any task until they feel it is one hundred percent “right”. This perfectionism can be something of a double edged sword; sometimes leading to projects that never get completed because too much time is spent on small details. Virgos are very shrewd and judicious in their decision-making. Precise, exact, and critical, the Virgo man doesn’t leave a stone unturned.The Virgo man is prone to studying every situation in great detail. He is interested in understanding… well, everything and everyone. His goal is perfectionism, in himself first, then his work, then the others around him and finally the world. He is also hardworking, efficient, and methodical and can usually work or reason his way out of any challenge. He has a remarkable sense of duty and will work towards serving the greater good, be it his family, friends, work network, or community. He is skilled at fact finding and enjoys getting to grips with minutiae that many others would find overwhelming. He is usually Employee of the Month or Most Valued Player on any team, as everyone knows that you can count on the Virgo man to get things right the first time, and every time. He also loves to help out others. Ruled by Mercury, you will never a find a Virgo man standing still for long. As fleet-footed as the Roman god that rules him, the Virgo man is a bundle of energy both mentally and physically. He is a powerhouse of achievement, often solving the next complex problem in his head while his hands do the work of the moment. He is also a very good communicator, as befits a sign ruled by the God of Messages. He has very discriminating tastes and neatness is an ongoing priority for him. Virgos are associated with Earth, and most Virgo men are grounded and practical. He is a sensible sort, with a tendency to worry overly much. Virgo is associated with the characteristics of the Virgin, such as modesty and purity. A Virgo man is balanced and fair. Most of all he has a certain noble quality to his bearing which is also humble at the same time. The embodiment of the classic Virgo man is the late American actor Paul Walker who was born 12 September 1973. Best remembered for his role as Brain O’Conner in the huge box office franchise, “The Fast and the Furious”, Walker was involved in several charities and foundations. With a degree in Marine Biology, Walker took time off from Hollywood to shoot a documentary with National Geographic, “Expedition Great White” which advocated for the protection of Great White Sharks. Walker was also active with his own foundation called Reach Out World Wide or ROWW which raised funds for regions that were hit by natural calamities. Charming, perfect, and intelligent, this woman seduces all that crosses her path, be it man, woman, or unicorn. The Virgo woman is very discerning, a natural critic, and a sharp analyzer of everything and everyone. Highly intuitive, she has the ability to sense what is off-key about a person or situation, and hone in to this with intent to improve. Don’t take it personally, because Virgos only mean well. The Virgo woman in your life is liable to wave a magic hand over chaos, imposing a gentle, perfect order on your universe. Governed by Earth, the Virgo woman is inherently practical, basing her thoughts on reality, not imagination. Sensation and experience are more important than emotion and fantasy to the Virgo woman. The lady walks with feet firmly on the ground, stepping gracefully and gently in her sensible reality. Detail oriented, she will be the only person to have brought a can-opener to a camping cookout, and then offer the china plates – that no one else thought to bring – to serve dinner on. This is a dynamite of a woman, who literally does think of everything. And where would you be without her, is the supporting refrain. Virgo women like systematic approaches and planned routines. They are usually collectors of some sort – butterflies, stamps, and stories. If there was any Virgo woman who personifies charm, perfection and intelligent it would be American singer Beyonce Knowles who was born on 4 September 1981. In addition to her obvious physical assets and massive singing talent, Beyonce is an innovator in music. Last 13 December 2013, she released her fifth studio album, “Beyonce” through iTunes without any prior announcement. It caught the fans and media by surprise and the album rocketed the top of the Billboard charts. As one of the most businesslike and methodical signs, Virgo pays attention to the finest details. This can be a big asset at work. 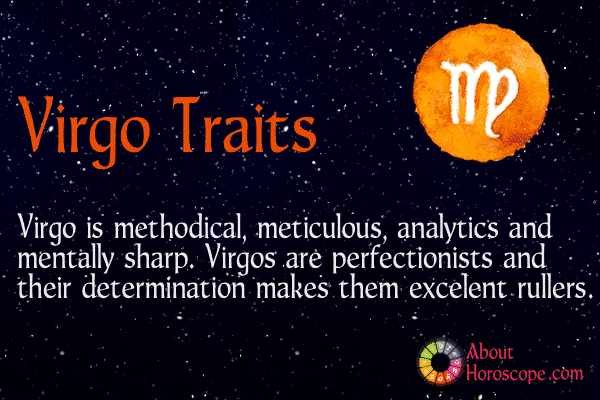 Logical, alert, bright and exceedingly practical, Virgos are deemed to be perfectionists. They are brilliant at analyzing people and situations in realistic and pragmatic ways. They are also adept at planning and carrying out creative projects. The sign of Virgo relates to the sixth house of the Zodiac, which relates to work. It’s no surprise that Virgos have highly developed analytical skills and brilliant at organizing projects to completion. Virgos are drawn to book writing, public service, government administration, financial market, bookkeeping, fields of science (medicine, pharmacy, psychology). An unusually high proportion of Virgos become highly successful writers. Virgos are well-suited to careers in which thoroughness, attention to detail, and efficiency are required. They prefer careers that allow them complete control over their work and environment. Virgos usually gain solid reputation for quality and an untarnished record. Virgos are often one of the most misunderstood signs of the zodiac. They are so careful to conceal their emotions; they are often seen as cold or uncaring. But don’t let the Virgos fool you! Underneath their shield is a sensitive, sensuous being, very capable of giving as well as receiving love. It’s not their style to fall head over heels for the first person that comes along. In fact, they are very selective when it comes to choosing a love partner. They can be very reserved, even shy at first, but when they’re positive that their feelings are being reciprocated, they are a warm, loyal and caring partners. Relationships tend to always be at the back of their minds, but often the last thing they seem to get around too. They can even sometimes feel like an unnecessary distraction to them. They are quite happy being left alone to get on with their own thing. Being involved with someone is not on the top of their priority list. Sometimes they can be too self-sufficient. They don’t like public displays of affection and rarely become jealous or give their partners reason to be. When things get rocky, they try their best to work things out. They have so much to offer and need love and affection just like everyone else, but because of their natural shyness, it’s hard for them to approach people. They’re uncertain how to establish a connection, and they tend to over analyze matters rather than allowing them to happen naturally. The most compatible zodiac sign love matches for Virgos are generally considered to be Taurus, Cancer, Scorpio and Capricorn. Their polar opposite, Pisces, can teach them to let go and just drift a bit every now and then. A Virgo should avoid relationships with Aries, Gemini, Leo, Libra, Sagittarius and Aquarius. Read about Virgo’s compatibility with other horoscope signs. As an analytical sign of the zodiac, Virgos are symbolically associated with the digestive system in the human body. Virgos are often prone to the problems related to the intestines and abdomen. Fitness and health conscious that they are, they have tendency to fret about their health. Thus, they also have a tendency for hypochondria. They may also suffer from other stomach diseases like indigestion, colic and intestinal infections, specifically owing to the undue stress and anxiety. Insomnia may also be health concern for the Virgos, as they find it rather difficult to switch off their ever-springy nervous energy. Health conscious Virgo makes an effort to stay physically fit and Virgo people don’t mind repetitive exercise routines, if they can see achievable outcomes. They enjoy tennis, racquetball, swimming, sailing, fishing, and biking, even though athletically they are not overly competitive. It’s just that they always seek to perfect whatever skills they may have, primarily for the sake of doing a thing well. People born under the star sign Virgo have three lucky numbers: 3, 6 and 7. Virgos are lucky on Wednesdays, and their lucky gemstone is an emerald, which is to be worn as a ring on small finger.Very favorable day for Virgos is Wednesday. Colors that will bring luck are green, white and yellow. So are you charming, precise, intelligent, meticulous, critical; or all of the above? We welcome you to share your thoughts and ideas with us at the “Comments” section.